On one of the finest tree lined blocks in all of Center City, discover this once in a lifetime opportunity to own a grand and immaculate, 5 bedroom, 3.2 bath historic home. The exquisite elegance and handsome details of this property cannot be overlooked, with soaring ceilings, light hardwood floors with oak trim, crown moldings and wainscoting, original grand staircase and several ornate marble fireplace mantles. Throughout the house you will find an abundance of large windows allowing natural light to illuminate each of the rooms, all of which boast tremendous closet space and unique built-ins. Sophisticated foyer entry to formal living room. Tall, original archway leads into formal dining room. Sun filled kitchen with glass tile back splash, maple cabinetry, granite counters, island bar counter, pantry, heated floor and stainless steel appliances including a Wolf stove, Asko dishwasher and Subzero refrigerator. Find solace watching the sun rise with your morning coffee on the private deck with lush planted area. Luxurious second floor master suite, with dressing room, sleeping area and spacious en suite bath. Great room offers unique post-modern pillars with pediments and indirect lighting to create a unique, welcoming, warm environment. Third floor offers 2 bedrooms, vintage 60's bath and laundry room. Fourth floor boasts 2 additional bedrooms and spacious bath. Finished basement/den along with an abundance of storage space and door to small yard. Seller offering one year one car prepaid parking at nearby garage. 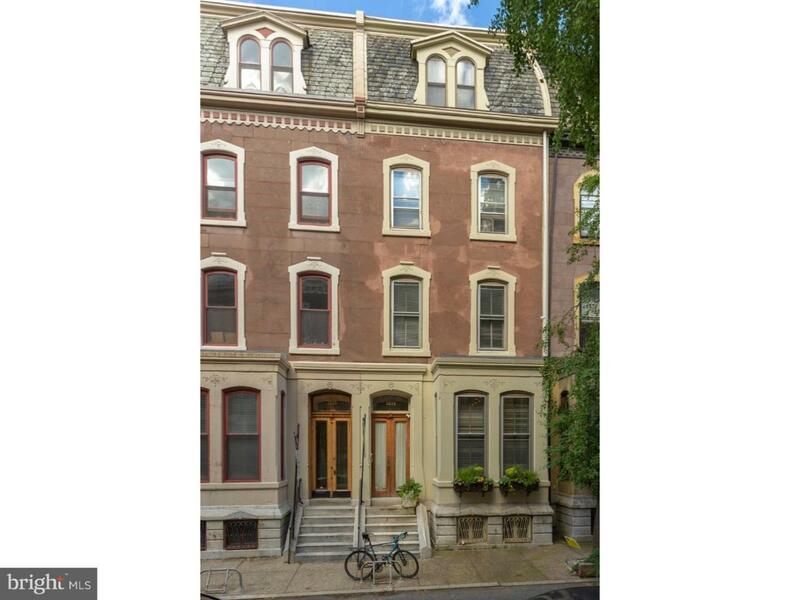 A truly impeccable and sophisticated 1800s home nestled on one of the most prestigious and admired streets in not only Rittenhouse Square/Fitler Square, but all of Philadelphia. SELLER OFFERING 1 YEAR 1 CAR PREPAID PARKING AT GARAGE AT 21ST & NAUDAIN. Check OPA for 2019 taxes due to possible citywide reassessment. Listing courtesy of Keller Williams Philly.